If the tortilla-making machine had produced perfect rounds every time back in the 1950s, the world may never have known the crunchy deliciousness of tortilla chips. Back in the day, Rebecca Webb Carranza and her husband owned the El Zarape Tortilla Factory in Los Angeles, California and were one of the first to automate tortilla production. Instead of wasting the odd-shaped ones, Carranza cut them into triangles, fried them, and sold them in bags.They were a hit! People all over began enjoying them dipped in salsa and guacamole and smothering them in cheese. In 1994 Carranza was honored with the Golden Tortilla Award for her contributions to the Mexican food industry, and in 2003 Texas named the tortilla chip the official state snack! “Round are sombreros. / Round is the moon. / Round are the trumpets that blare out a tune. Round are tortillas and tacos too. / Round is a pot of abuela’s stew. 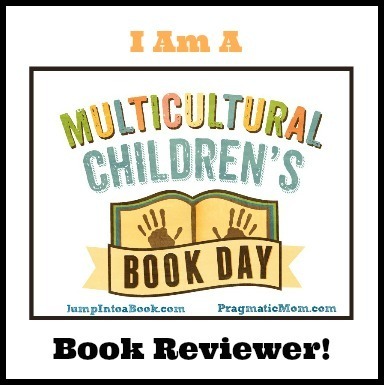 / I can name more round things can you?” With wonderful, lyrical verses, Roseanne Thong introduces children to the shapes—circles, squares, triangles, rectangles, ovals, stars, and more—that make up their multicultural world. Image copyright John Parra, 2013, text copyright Roseanne Thong, 2013. Courtesy of Chronicle Books. Here are round chiming campanas and nests full of swallows, square ventanas for peering through and clocks for telling time. Rectangles are cold paletas to eat on a hot summer day and the ice-cream carts that deliver them, and triangles make tasty quesadillas and gliding sailboats. Each verse ends with an invitation for kids to find more shapes around them—an invitation that’s hard to resist! Rebecca Thong’s bright, fun-to-read verses shine with evocative words that create a concept book that goes beyond the introduction of shapes to celebrate the sights, sounds, and sensations that make up readers’ lives. Helping children find shapes in household objects, food, and other familiar places, makes them more aware of the math all around them. They will be excited to point out the squares, triangles, circles, and more that they encounter every day. Spanish words sprinkled throughout the story are defined following the text. John Parra’s beautiful folk-art illustrations, which are sure to put a smile on kids’ faces, immerse readers in the daily life of a Latino town. People dance, cook, play games, walk in the park, attend a festival, and more—all while surrounded by colorful shapes. Kids will love lingering over the pages to find all of the intricate details and may well want to learn more about what they see. Learn more about Roseanne Thong and her books for children and adults on her website! View a gallery of books and artwork by John Parra on his website! It’s easy to make these yummy tortilla chips at home! Why not invite your friends over and bake up a batch or two to enjoy while playing or reading together? Chips will become crispier as they cool. This week was established to raise awareness and promote literacy and the joys and benefits of reading. During the week, children’s authors and illustrators attend special events at schools, bookstores, libraries, and other community centers to share their books and get kids excited about reading. To learn more about how you can instill a lifelong love of learning, visit ChildrensAuthorsNetwork! A little purple period feels like writing a story. He goes to visit Pencil and Paper and tells them his plan. They want to help, but Pencil says, “We are at a loss for words.” So the three set off to find some. Question Mark sees Period searching here and there and asks what he’s doing. When he finds out about Period’s plan, Question Mark has, well… lots of questions and joins the hunt. Image copyright Denise Holmes, 2016, text copyright Jodi McKay. Courtesy of Albert Whitman and Company. Exclamation Point is excited to learn about the story writing idea and is eager to help. “What do you know about words?” Question Mark wonders. “Lots!” Exclamation Point answers as he heads off the page. “Let me get them for you!” While Exclamation Point is gone, Question Mark and Period meet up with Quotation Marks, who have sage advice for these two. “‘Seek and ye shall find,’” they offer. Just then Exclamation Point comes back with an armload of words: Once, Upon, A, and Time. Just as he’s about to pass them over, though, he trips and the words scatter in a jumble of letters. Undeterred, Exclamation Point hurries off to get more words. Then Parentheses meanders by. Question Mark thinks maybe they know where words hang out. “I might,” one says, raising everyone’s hopes. But then she adds, “(although I doubt it).” Period is disappointed and even a little miffed when he sees Exclamation Point rushing around waving a net. But Exclamation Point’s just trying to corral some rather active words who would rather “run, jump, skip, hop” freely. Colon offers aid as long as there are peanuts, but Period thinks the whole thing is getting out of hand. In fact, Period decides to quit. But not so fast! Exclamation Point has something to show everyone. “Look!” Exclamation Point says, and they all gaze upward to find all the words they’ve said hanging in the air. “They were here all along,” Period says. Now Period has everything to write a story—except an idea. Exclamation Point suggests they all write the story together. Jodi McKay’s adorable set of punctuation marks take kids on a whirlwind ride to find words that Period can use to write a story. As each punctuation mark joins the search, McKay gives them personalities and conversation to match their grammatical uses. Readers will giggle at the mishaps and setbacks that beset Period’s creative process but empathize with him as his dream of writing a story seems to slip away. When the friends discover that the words they’re searching for are right at hand, children will see that they too have the words they need to express themselves creatively and even in social situations. Punctuation has never been so cute! With their sweet smiles and expressive stick arms and legs, Denise Holmes’s colorful, ready-to-help punctuation marks, pencil, and paper are true friends as they take on Period’s wish and make it their own. Dialogue bubbles make it easy for kids to understand how the various punctuation marks are used in a sentence, and dynamic typography sprinkled throughout the pages show action and add to the humor. Readers will also have fun guessing why Colon is so fond of peanuts in a clever running joke. A charming way for children to engage with writing and punctuation, Where Are the Words is a grammatical mystery that would make its mark on home, classroom, and library bookshelves for fun story times and composition lessons. Discover more about Jodi McKay and her books on her website. Can you find the twelve types of punctuation in this printable puzzle? Tagged Albert Whitman & Company, Denise Holmes, Jodi McKay, picture book review, Picture Books, Picture Books about Friendship, Picture Books about Language Arts, Picture Books about Literacy, Picture Books about Punctuation, Picture Books about Writing, Punctuation Word Search Puzzle, Where Are the Words? Today we celebrate that most marvelous, stupendous, spectacular, cool, awe-inspiring, remarkableand—one from my early youth—groovy book, the thesaurus! Without its incredible cross-referenced lists of synonyms and antonyms, the world would be much more boring, dull, lackluster, monotonous place. Today, spice up your speech and writing with the perfect word to express all the nuances of life! While just a young child, Peter, along with his mother, his uncle, and his baby sister Annette, travel to their new home following the death of his father. It would not be his first move, and in the absence of long-time friends, Peter found companionship in books. When he was eight years old, he began writing his own book titled: Peter, Mark, Roget. His Book. But this was not a book of stories or even one story; it was a book of lists. The first list was divided in two. On one side were the Latin words he knew; on the other were their definitions. Image copyright Melissa Sweet, 2014, text copyright Jen Bryant, 2014. Courtesy of Eerdmans Books for Young Readers. An idea crept into Peter’s mind for a book where “all the ideas in the world could be found in one place,” and people could “find the best word, the one that really fit.” When Peter was 14 he entered medical school in Edinburgh, Scotland. Upon graduation at 19, his uncle told him that patients would be wary of a doctor so young. To gain a bit of experience and maturity, Peter became a tutor to two teenage boys. At last Peter set up his medical practice in Manchester, England, where he took care of the factory workers, who “were poor and often sick.” At night Peter worked on his book of lists, and in 1805 he declared it finished. “It had about one hundred pages, one thousand ideas, and listed more than fifteen thousand words!” Eventually, Peter moved back to London where he joined science societies and attended lectures. “Before long, he was asked to give lectures too,” and once-shy Peter astonished his audiences with his knowledge of math, magnetism, and other scientific subjects. He even invented a portable chess set. “In 1852, Roget published his Thesaurus, a word that means ‘treasure house’ in Greek.” It was an instant best seller, and Peter became a popular author. But he never stopped making lists. Following the text, a timeline of principal events in Peter’s life as well as world events allow readers to better understand the historical period in which Peter worked. Extensive Author’s and Illustrator’ Notes also expand on Roget’s biography, and resources for further reading and research are included. Jen Bryant’s biography of a brilliant boy who grew up to give the world its most fascinating and comprehensive collection of word lists, is a spritely telling of Roget’s life and revelation into his personality, which was perfectly suited to his scientific and written accomplishments. Children will appreciate Roget’s reactions to his mother’s worries as well as the message in his well-rounded pursuit of science and writing. Through Bryant’s captivating and lyrical storytelling, children will be inspired by Roget’s journey from shy child to much-accomplished adult. Image copyright Melissa Sweet, 2014, courtesy of Eerdmans Books for Young Readers. Melissa Sweet beguiles readers with her mixed media, collage, and watercolor illustrations that are as jam-packed with ideas, images, portraits, and typography as Roget’s thesaurus is full of words. In the early pages describing Peter’s childhood, the pages contain simple framed pictures of Roget and his family. As he grows, however, his lists of words are transformed into vibrant artwork that jostles for position from corner to corner of the pages. In the midst of these, delicate watercolors portray Peter as he strolls through a garden, takes his young charges to Paris, treats his patients, lectures, marries, and finally publishes his thesaurus. A special mention must be made of the typography, which at times in the text runs down the center of the page in one- or two-word lines, mirroring Roget’s love of lists, and in the illustrations presents the myriad synonyms in a mixture of colorful block letters, fine print, and calligraphy. For bibliophiles, wordsmiths, scientists, and history buffs, The Right Word: Roget and His Thesaurus is just the right book for home libraries. Discover more about Jen Bryant and her books as well as news, contests, and events, visit her website! Learn more about Melissa Sweet and her books and have fun with the downloadable activities you’ll find on her website! Watch this The Right Word: Roget and His Thesaurus book trailer! When you’re looking for just the right word, where do you go? To the thesaurus of course! Can you find the 25 synonyms for “Word” in this printable Word Words Word Search Puzzle? Here’s the Solution! Appreciate a Dragon Day was established in 2004 by author Danita K. Paul to celebrate the publication of her novel DragonSpell, the first book in her Dragon Keepers Chronicles series. The holiday now encourages all readers to get involved with reading through fun activities—dragon-themed, of course! Teachers, librarians, and all those who love reading can find lots of suggestions for creative ideas that encompass art, crafts, displays, drama, and many other mediums on Danita K. Paul’s website. So, round up your favorite dragon books and breathe some fire into your reading today! Image copyright Éva Chatelain, 2018, text copyright Kell Andrews, 2018. Courtesy of Sterling Children’s Books. When Rosehilda got home she asked her grandfather what all the fuss was about. He told her about the Book Dragon, who instead of hoarding gold, collected books. Rosehilda had never heard of a book, and her grandfather explained that it was “letters and words written on papers that are attached together.” He pointed out the window to Scrump Mountain and told Rosehilda that the Book Dragon lived deep inside and stole any book brought into the village. The next day at school, Rosehilda declared that the school needed books and that she was not afraid of the Book Dragon. Mr. Percival explained that after the dragon snatched a book, she terrorized the villagers the next night, and he sent her home again with another note etched into a candle stub. On the way home, Rosehilda met a peddler who had a book in her pile of wares. She gave it to Rosehilda in exchange for the candle stub. She went to the top of Srump Mountain and peered into the dragon’s cave. The Book Dragon was lying atop an immense pile of books. She looked surprised to see Rosehilda standing there. Rosehilda summoned her courage and demanded that the dragon return her book. The Book Dragon apologized and explained that because she was too big to live in the village, books were the only friends she had. Rosehilda scolded the dragon for stealing so many books. The dragon said she only meant to borrow them, but when she tried to return them, the windows were locked and people screamed when she knocked. The dragon agreed to give Rosehilda her book back, but Rosehilda had a hard time finding it among so many books. While searching for it, Rosehilda and the Book Dragon began stacking the books “by subject and author.” At the end of the day, they had plenty of piles and more books to sort, and Rosehilda hadn’t found her book. The Book Dragon suggested she borrow a different one. She read late into the night, and the next day she went back to the dragon’s cave to help sort books. She left with another book. This went on all week. Finally, all the books were sorted and Rosehilda found her book. She was excited that she wouldn’t have to come back, but the Book Dragon looked sad and suggested that she “borrow another book…and come back tomorrow.” That gave Rosehilda an idea. The next day at school, Mr. Percival and the other students were horrified to see the dragon outside their window, but Rosehilda explained that she was just returning their books. Now the Book Dragon oversees the “Official Village Library of Lesser Scrump,” and everyone reads as much as they want! Kell Andrew’s clever story will delight book lovers of all scales with its mix of fantasy, mystery, courage, and friendship. Fearless Rosehilda is a plucky role model for all kids, and the Book Dragon’s desire for company will melt readers’ hearts faster than a breath of fire. Andrew’s storytelling reflects the best of fairy tale lore for a modern audience, with touches of humor, mistaken motives, and a creative resolution. Éva Chatelain bridges the medieval and the familiar in her bright illustrations that draw on the rich yellows, reds, and greens of leather-bound books, piles of gold, fiery emotions, and woodland villages. Chatelain introduces brave Rosehilda as she challenges her teacher and buys a book, but she also reveals the trepidation Rosehilda overcomes to confront the Book Dragon, showing readers that even the most courageous people can feel fear too. As Rosehilda reads her treasured book, kids’ suspense will quicken to see the silhouette of the dragon outside her window. The stacks of books that Rosehilda and the Book Dragon build are cunning references to library stacks, and the final images of a happy town and a happy (dragon) librarian will charm readers. An enchanting story for book buffs, dragon devotees, and fairy tale fans, The Book Dragon would be a favorite addition to story times and home, classroom, and public libraries. Discover more about Kell Andrews and her books on her website. To learn more about Éva Chatelain, her books, and her art, visit her website. In this group of darling dragons, each dragon has a twin. Can you help them find each other in this printable puzzle? National Math Storytelling Day was established on today’s date in 2009 by Maria Droujkova, founder of The Natural Math Community at Naturalmath.com, and her daughter to encourage people to share the joys of math with children through stories and games. Having fun with math is one of the best ways to get kids excited about learning and working with this most important subject. Celebrate today with math stories that involve patterns, spatial relations, quantities, logic, puzzles, and numbers. You can even sing math songs and tell math jokes! It’s clean up time for Daddy and his toddler! As they put the books back on the shelf, Daddy says, “‘Let’s reach up high—your books go up on the top shelf.’” He then prompts, “‘What goes down below?’” With the blocks all stacked on the bottom shelf, the pair move on to putting away the train engine, which has its own special place next to the little station. “‘Choo-choo!’” says the child. Image copyright Ying-Hwa Hu, 2018, text copyright Ellen Mayer, 2018. Courtesy of Star Bright Books. Playing with Daddy makes cleaning up even more fun, and the little one pretends to take a nap with the teddy bears when they’re put inside the cardboard playhouse. The tot giggles and jumps up with a “‘Wake up-up-up!’” just in time to find the train’s caboose hiding behind the chair. A note for parents, grandparents, and caregivers from childhood education expert Susan C. Levine on how they can find opportunities to talk about spatial relations during everyday activities is included. Gender neutral clothing and hairstyle as well as an absence of pronouns makes this a universal story. Image copyright Ying-Hwa Hu, 2018, text copyright Ellen Mayer, 2018. Translation by Audrey Martinez-Gudapakkam and Dr. Sabrina De Los Santos. Courtesy of Star Bright Books. Ellen Mayer continues to add to her sweet and joyful series of books for little ones and the adults in their lives that model ways parents, grandparents, and caregivers can talk with children to help them develop language and math literacy at the youngest ages. In Clean Up Up Up!, the concept of spatial relations is organically introduced to toddlers through the motions and words used while putting items in their proper place, stepping up on a stool to use something out of the child’s reach, and even when eating. Research shows that talking with children at all ages about math concepts such as positions and locations improves their understanding and leads to better success in school and beyond. 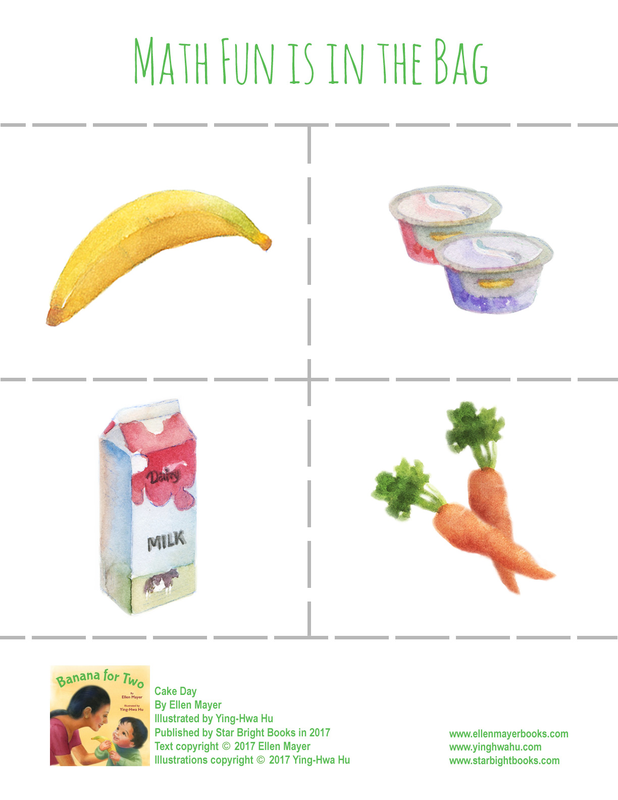 The loving relationship between father and child in Mayer’s early language development book A Fish to Feed, is expanded on here as the same interracial family enjoys clean-up and dinner time. The engaging dialogue between Daddy, Mommy, and their toddler will captivate young readers and inspire adults to continue the story in their own daily lives. Ying-Hwa Hu’s adorable toddler giggles and plays while soaking up the rich language of positions and locations that the father clearly points to while cleaning up. Little readers will be charmed by the enthusiastic child and the little puppy that follows along. Images of books, toys, washing up, and dinnertime all demonstrate the positions and locations referred to in the story, while other details provide an opportunity for adults and children to expand on the text (the fish from A Fish to Feed swims inside its bowl and balls sit inside a bin, for example). Hu’s vivid colors as well as the smiles and enthusiasm with which Daddy, Mommy, and their child interact make Clean Up, Up, Up! a feel-great educational read. Clean Up, Up, Up! would make a wonderful gift and would be an excellent addition to home, daycare and preschool classrooms to spark playful learning experiences. Discover more about Ellen Mayer and her books on her website. To learn more about Ying-Hwa Hu, her books, and her art, visit her website. Kids love pretending with their toys and little playhouses. With this craft you and your child can make a playhouse with recycled items and lots of imagination. While making the house, talk with your child about the building process using spatial relation words and ask for their ideas on what it should look like. Once finished, you and your child can make up stories using words that use spatial relations as characters come in the house, go out of the house, peek in or out of a window, sit on the roof, wait under the window, sit next to a friend while having tea, and so much more! Founded in 2004 by Jeff Rubin, National Punctuation Day promotes the correct usage of all those little marks that make reading clearer and more meaningful. Do you ever wonder just how to use the ; and what’s the real difference between – and —? It can all get a little confusing. But misplaced or misused punctuation can result in some pretty funny mistakes—or some serious misinterpretations. Whether you love punctuation, would like to understand it better, or just use it to make emojis, today’s holiday will make you : – ). To find information on the day, resources for using punctuation correctly, and a fun contest to enter, visit Jeff Rubin’s National Punctuation Day website. Boyds Mills Press sent me a copy of A Bunch of Punctuation to check out. All opinions are my own. I’m also excited to partner with Boyds Mills Press in a giveaway of the book. See details below. In the world of writing and reading, the letters of the alphabet seem to get all the acclaim as they create cool words and form captivating sentences. But what about those little marks of punctuation that separate clauses, slow readers down, add mystery and excitement, and even tell readers when they should stop? They’d like a little attention too! In this enchanting collection of poetry, they get it as commas, apostrophes, quotation marks, and all the rest are put center stage—as you will see! Image copyright Serge Bloch, 2018, Comma by Lee Bennett Hopkins, 2018. Courtesy of WordSong. Image copyright Serge Bloch, 2018, poems selected by Lee Bennett Hopkins, 2018. From Apostrophe by Amy Ludwig VanDerwater. Courtesy of WordSong. Image copyright Serge Bloch, 2018, poems selected by Lee Bennett Hopkins, 2018. From A Punctuation Tale by Rebecca Kai Dotlich. Courtesy of WordSong. Lee Hopkins Bennett gathers a group of the most inventive and popular poets for children in this collection that turns learning about punctuation into a flight of fancy, a comical romp, and an all-around engaging way to learn how these tiny show-stoppers work on a page. Each poem will spark discussions and “Ah-ha” moments about the function of punctuation and will make a grammar lesson one of the most eagerly anticipated classes of the day. With his signature line drawings and humorous flair, Serge Bloch gives each type of punctuation mark a unique personality and purpose whether it’s creating a contraction, crying a puddle of lonely tears, lassoing words, or linking clauses in a train of thought. Bloch’s bold colors and action-packed pages bring the punctuation to life and will delight readers. For young and older grammarians and poetry lovers, A Bunch of Punctuation is a bunch of fun to add to home, school, and classroom libraries. To learn more about Lee Bennet Hopkins, his books, and his poetry, visit his website. To learn more about Serge Bloch, his books, and his art, visit his website. To be entered to win, just Follow me on Twitter @CelebratePicBks and Retweet a giveaway tweet during this week, September 24 – 30. Already a follower? Thanks! Just retweet for a chance to win. A winner will be chosen on October 1. Giveaway open to US addresses only. | Prizing provided by Boyds Mills Press. Have fun finding the twelve types of punctuation in this printable puzzle!